Visible-light imagery from NASA's Aqua satellite revealed the development of Tropical Depression 13S into a tropical storm. 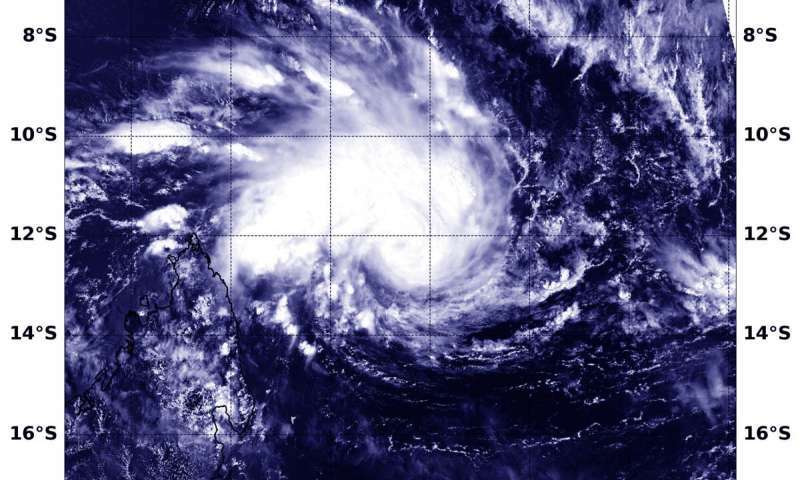 Tropical Storm Gelena intensified rapidly and appeared to have a cloud-filled eye. At 5:20 a.m. EDT (1020 UTC) on Feb. 6 the Moderate Resolution Imaging Spectroradiometer, or MODIS, instrument aboard NASA's Aqua satellite provided a visible image of Tropical Storm Gelena in the Southern Indian Ocean. The image showed the storm developing an eye, with bands of thunderstorms wrapping into the low-level center. At 10 a.m. EDT (1500 UTC) on Feb. 6, the Joint Typhoon Warning Center or JTWC noted that Trami had maximum sustained winds near 45 knots (52 mph/83 kph). It was centered near 12.3 degrees south latitude and 53.4 degrees east longitude. That's 504 nautical miles north-northwest of St. Denis, La Reunion Island.